Andrew’s Government is set to kill baby koalas, and other ‘protected wildlife’ that survive bush fire!- Write to Government Now! Reasons why people signed Stop Cruelty to Kangaroos in NSW! The Petition- Stop NSW Kangaroo Cruelty! Us and Them — the End Game? How Many Kangaroos Were There? Who we are and what we do…. A coalition of citizens and scientists including Professor Peter Singer, Barrister Cliff Papayanni, Dr. Daniel Ramp, Dr. Dror Ben Ami, Dr. John Auty and Kakkib Li’dthia Warrawee’a along with co-editors Maryland Wilson (AWPC) and Dr. David Croft have joined in this book to expose the myths underlying the persecution and exploitation of Australia’s maligned National symbol – the Kangaroo. With over 260 pages and stunning images throughout, this book questions whether the dominant practice of exploiting kangaroos for cheap meat and hides or controlling them for dubious and overblown land management benefits – justifies the massive kill, the answer is no! From over 30 million kangaroos shot in the last decade, at least 3 million kangaroo young-at-foot were abandoned to a cruel death. 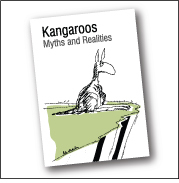 Kangaroos: Myths and Realities celebrates kangaroos and their kind and exposes the callous failings of control programs and commercial use for meat and hides. Soft cover, 170mm x 240mm, 264 pages – full colour, with introduction, bibliography and index. 100% cotton. Currently only available in medium but more sizes to come. 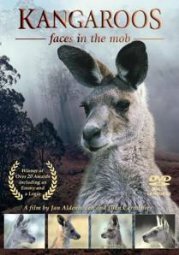 This classic film follows the day-to-day drama within a mob of wild kangaroos living in a remote valley of magical beauty. Behind every face is a personality. Follow the destinies of two lovable young joeys – a female called Sunshade and a little male called Jaffa. Witness everything from birth to the dramatic boxing matches between males. Suitable for all ages, this beautiful real-life exposè of Australia’s most famous animal will captivate and enthral you from beginning to end. The original film is now a multi-language DVD available as either PAL or NTSC, both Region 0, for playing anywhere around the world. Popular at home, in schools, with tourists, and as a gift for friends and family overseas. Eve Kelly on How Many Kangaroos Were There? Richard Hookway on How Many Kangaroos Were There?